This initiative is part of the Pratham Books' Champions program where we encourage our community of volunteers to conduct reading sessions. These sessions are conducted free of cost and mostly with children from under-served communities. The Pratham Books' Champions program is a one-of its kind volunteer program that has scaled to a national & international level with more and more volunteers joining in each year. 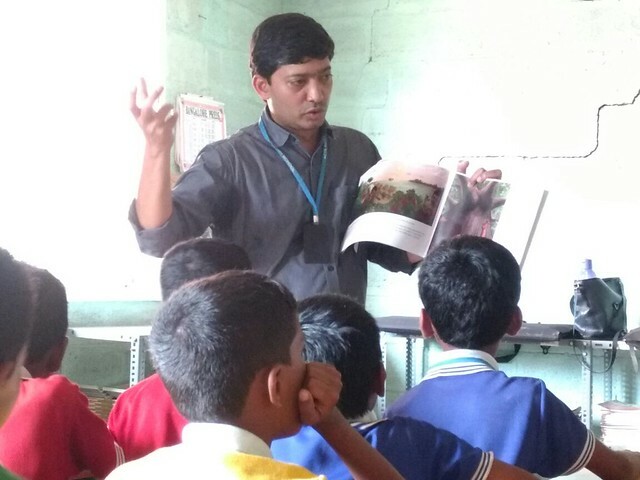 For this year’s edition of ‘One Day One Story’, volunteers from Oracle Bangalore joined us to take stories into classrooms, thanks to our partners Mantra4Change. On the bright morning of September 10th, about eight volunteers from Oracle’s Bangalore facility reached the Nirmal Vidyalaya on Hosa Road. The school had an ongoing Teacher’s Day celebration which included dances and skits put up by students, a friendly cricket match between students and teachers and of course our storytelling sessions ☺ The volunteers divided themselves in six groups and headed to groups of children from Grades 4th, 5th and 6th. The story of 'The Elephant Bird' by Arefa Tehsin, Sonal Goyal and Sumit Sakhuja enthralled children of Grade 5 as they wondered if brave Munia could save the giant bird! In the Grade 4 classroom, children were actively participating in identifying the different seeds they find in the fruits they eat as they went on a seed collecting journey with Tooka, Poi and Inji in 'Let's Go Seed Collecting' by Neha Sumitran and Archana Sreenivasan. In Grade 6, the children kept interrupting volunteer Senthil to confirm and re-confirm if Jadav ‘Mulai’ Payeng in 'Jadav and the Tree-Place' by Vinayak Varma is a real man who actually built an entire forest on his own. The story telling sessions were followed by impromptu singing sessions, chit-chat with the students and a lot of idea and noise exchange! Hear Khushboo Awasthi, Co-Founder of our partner organisation Mantra4Change talking about the importance of such sessions for the children underlining the exposure the corporate volunteers bring into classrooms. Our sincere thanks to all the volunteers from Oracle, children and teachers of Nirmala Vidyalaya and the Mantra4Change team in making this session memorable! Together we can take a story to every child in every corner of the country. One Day, One Story... many translations! UPDATE: 'The Elephant Bird' is available to read in Assamese , Hindi, Kannada, Marathi, Odia, Sanskrit , Tamil , Telugu , Bengali, Malayalam, Punjabi, Konkani and English . Pratham Books' One Day, One Story is back! The nationwide storytelling campaign is in its 5th year. Through the campaign, we encourage our community of volunteers to use one book to conduct reading sessions, free of cost with children from under-served communities. For more details about the event click here. This year's chosen story is The Elephant Bird by Arefa Tehsin, Sumit Sakhuja and Sonal Goyal. The story about a magical bird, and a brave, curious child is also the tale of an unlikely friendship and rare courage. We totally love this one! Last year 2500+ storytellers joined us to take The Boy and the Drum across India (and some other parts of the world!). This story was translated to 7 languages on StoryWeaver. The more languages a story is translated in, the more it will travel to be read and enjoyed by children. Yes, you guessed it right - we need translation volunteers for this year's story. 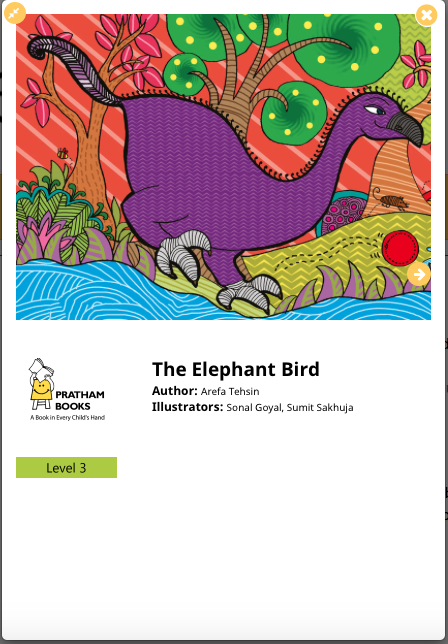 The Elephant Bird' is already availble in English, Hindi, Kannada, Gujarati, Telugu, Urdu and Marathi. Your contribution to add a version of this story on StoryWeaver will go a long way in multiplying the number of PB Champs' reading sessions and in turn, help reach more and more kids. Wouldn’t that be lovely? We need all the translations to be on the site before 20th August, 2016. P.s: If you're interested in joining us as a PB Champ this year, click here to enrol.